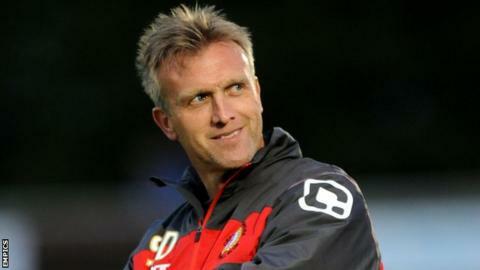 Crewe Alexandra boss Steve Davis says former players should be encouraged to join a "refereeing academy". Port Vale boss Micky Adams has questioned the fitness levels of lower league officials. "I've always felt a refereeing academy would be the best thing - using ex-players and those [young players] let go," Davis told BBC Radio Stoke. "They know the game and have been brought up since they were kids at clubs and know what to look for." Many local football authorities offer opportunities for inexperienced officials to join referee academys, but these are not specifically designed for ex-players. However, regardless of a referee's experience, Davis feels that players should take responsibility for their conduct towards match officials. "You can't satisfy both teams. He [the referee] will always upset one team with his decision," Davis said. "It's how the players react to that decision and that they don't crowd around the referee. "I think players that do crowd the referee should be punished for that. If you were to give a yellow card for someone approaching a referee, it might stamp it out."